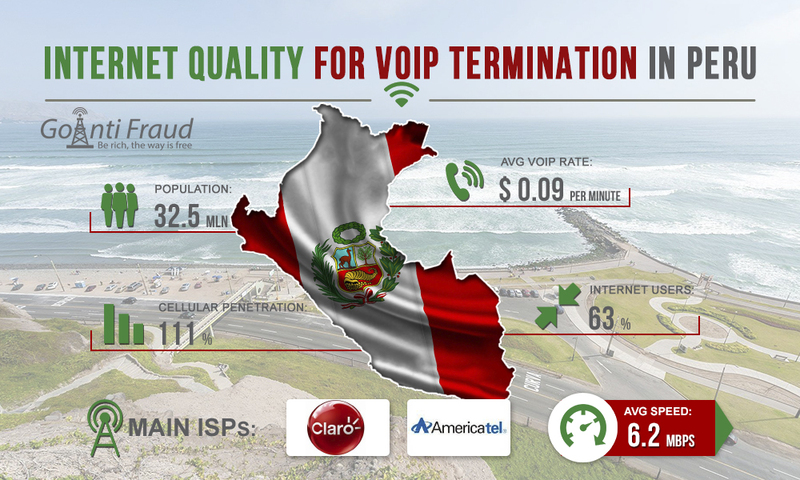 Peru provides good opportunities for earning on termination with a competent approach to choosing a tariff plan for outgoing calls. The country has a well-developed mobile sector, which allows the terminator to receive revenue of at least $50 from a channel. But what is the situation with the Internet connection in Peru? Broadband penetration in Peru is lower than the average for Latin America today (63%, which is about 20 million connections). At the same time, the government is active in stimulating the Internet services sector. Deficiency of broadband penetration is caused by poverty of the country, limited literacy of the population and specific geography of the territory. In addition, the market has limited competition, which has affected the relatively high cost of services. Despite the above nuances, experts predict improvement in the state of the broadband access sector in the coming years. The government has implemented a program to connect fiber optic Internet to remote areas of Peru. Thus, the indicator of Internet penetration will grow. At the moment, the average connection speed in the country is 6.2 Mbps. This is a good indicator - this speed is enough for the uninterrupted operation of voip gsm gateway ebay for a small number of channels in one location. In addition, in large cities, it is possible to order an Internet plan with a higher speed. You can connect the Internet, using the services of one of the popular Internet providers - Claro, Americatel Peru.